Ever had a page or post in WordPress that you wanted to name a certain name and whenever it saved, it appended it with “-2” or “-3”? Example, I was trying to create a forum page with Mingle in WordPress and so I was naming my page, domain.com/forum. However, because of earlier trials I had already once had a forum page, which I had deleted. Deleting the page didn’t delete the permalink that was created. So when I tried making the page again I ended up with domain.com/forum-2; which is not what I wanted. Below are some simple instructions on deleting an old permalink. You need to login to phpMyAdmin, so you can get access to your WordPress database. If you have Cpanel, the link to phpMyAdmin is located under the “Databases” header. If you don’t have Cpanel, check with your webhost for the URL for phpMyAdmin. 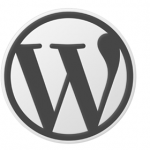 Once you are in phpMyAdmin, highlight and click into your WordPress database in the top left. 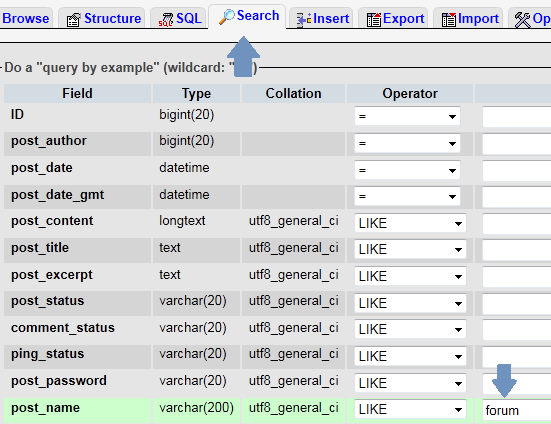 In my example, I have a db called db_wp. On the left hand side, scroll down and click into wp_posts. Click on the Search tab and under the post_name row enter in the name of your old permalink page name you are trying to find and delete. In my example, I am entering forum because I want to delete it, so I can again use it. Once entered, click “Go” in the bottom right. If multiple rows return with that name, look for the one that says trash under the post_status. Most likely only one row will return, and so that is the one we want to delete. To delete it, click the checkbox for that row, and then click the red X. Now go back to your page/post that you are wanting to name, and you should now be able to use that name. For example, when I created a page, I was now able to use domain.com/forum. Thankyou so much for saving me valuable time with this tip. 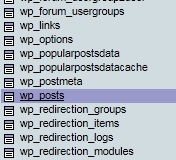 I couldn’t work out why my deleted pages prevented me from using the WordPress permalink names that I wanted to – even after clearing the trash. Appreciate the information! I had to sift through 8 or 9 other websites on this issue before I finally found this helpful information. All other sites gave the novice answer of ‘delete permanently from trash’. No offense, but that is pretty obvious. I knew it had to be some lingering data in the database. This was a great tutorial – thanks again! Great! Glad we could help out.